NOTES: ex-Aurora kit, though significantly cleaned up. The Batmobile is the automobile of DC Comics superhero Batman. The car has evolved along with the character from comic books to television and films. Kept in the Batcave, which it accesses through a hidden entrance, the Batmobile is a gadget-laden vehicle used by Batman in his crime-fighting activities. Batman first drove in Detective Comics #27 (May, 1939). A sedan, the vehicle was simply referred to as "his car". It soon began featuring an increasingly prominent bat motif, typically including distinctive wing-shaped tailfins. In the early stages of Batman's career, he modified it with armor and technologically-advanced automotive customization and turned the Batmobile into a sleek street machine. The Batmobile has gone through numerous incarnations, and as state-of-the-art technology has continued to advance, the vehicle has had to change to stay a step ahead of real-life cutting edge advances. The Batmobile built for and used in the 1966–1968 live action television show Batman and its film adaptation was a customized vehicle that originated as a one-off Ford concept car of the 1950s. The TV Batmobile was based on the Lincoln Futura Show Car, originally created by William M. Schmidt and his design team at the Lincoln Styling Department; its rakish lines are said to have been inspired by the mako shark and the manta ray. In 1954 the Futura prototype was built entirely by hand by the Ghia Body Works in Turin, Italy at a reported cost of US$250,000; it was unveiled in its original pearlescent Frost-Blue white paint finish on 8 January 1955 at the Chicago Auto Show. In 1959, sporting a fresh red paint job, the Futura was featured in the film It Started with a Kiss, starring Debbie Reynolds and Glenn Ford. In late 1965 20th Century Fox Television and William Dozier's Greenway Productions contracted renowned Hollywood car customizer Dean Jeffries to design and build a "Batmobile" for their upcoming Batman TV series. He started customizing a 1959 Cadillac, but when the studio wanted the program on the air in January 1966, and therefore filming sooner than he could provide the car, Jeffries was paid off, and the project went to Barris. Barris had somehow already come into possession of the Futura, which had been parked behind his Hollywood shop for several years. With only three weeks to finish the Batmobile (although in recent years Jeffries says that his car was dropped because he was told it was needed in "a week and a half", he was quoted in 1988 as saying "three weeks" as well), Barris decided that, rather than building a car from scratch, it would be relatively easy to transform the distinctive Futura into the famous crime-fighting vehicle. Design work was conducted by Herb Grasse, working as an associate designer for Barris. Barris hired Bill Cushenberry to do the metal modifications to the car and its conversion into the Batmobile was completed in just three weeks, at a reported cost of US$30,000. Barris retained ownership of the car and leased it back to 20th Century Fox and Greenway Productions for use in the series. The estimated 1966 value of the Barris Batmobile was about $125,000, but today it is estimated to be worth at least US$2 million. In December 1965 Ford sold the Futura to Barris; despite its huge original production cost—the equivalent of approximately US$2 million in 2009 -- Barris was able to purchase the vehicle for the nominal sum of $1.00 and "other valuable consideration". When filming for the series began, several problems arose due to the age of the car: it overheated, the battery went dead, and the expensive Mickey Thompson tires kept blowing. By mid season, the engine and transmission were replaced with a Ford Galaxie's. The most frequent visual influence of this car is that later Batmobiles usually have a rear rocket thruster that fires as the car makes a fast start. Visit the reference link to find out more. When I visited the LHS today, I found this kit on the 'new kit' shelf as well as several more on the regular shelves. Naturally, I grabbed one so fast I nearly hurt myself. I've always wanted a model of the TV show Batmobile and wasn't into forking out the exorbitant funds for the old Aurora kit. I had wondered why no one had produced this since as it surely would be popular. The owner of the LHS told me that Revell had already started cutting molds for this car (apparently in 1/25) when it was discovered that the real owner of the rights to the Batmobile could not be determined. DC comics thought they owned the rights, George Barris thought he owned the rights, the current owner of the car itself thought he owned the rights and the company that produced the TV series thought they owned the rights. Regardless, the Revell project was still-borne, much to the detriment of us all. I note on the box that the only licensing note is for DC comics so perhaps they got things straightened out. This is not a complex kit and coming from the late 1960s, there are certain niceties that you won't see. For instance, most of the parts have large ejector pin marks and part numbers molded on the part itself. Some of these will need to be removed. This is also a curbside so no atomic engine for fans. 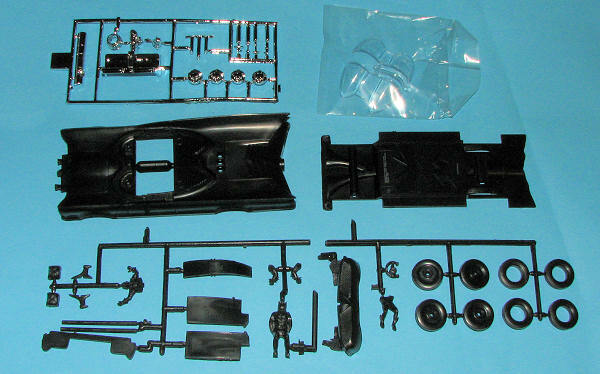 In addition, the kit has plastic axles and plastic wheels that take an insert. The kit instructions are very much like the old Aurora versions. There are only three construction steps as this kit has fewer than 30 pieces. Generic color information is also supplied. A decal sheet comes with the kit for the red trim stripes and the red for the Bat hub caps. The color of the red is nearly fluorescent and quite light, though I would imagine that this would be toned down once applied to the black car. The other option would be to paint this trim, but it would be VERY tape intensive to do so. I should mention that the instructions' image of the build up showing where the decals go is very dark. I recommend grabbing one of the many clear images from the internet before applying decals. Oddly, all the markings are not shown on the box art. Perhaps they are travelling so fast that the paint stripped off. Frankly, I can't think of anyone who doesn't think the batmobile is neat and I'm sure that PL will sell as many as they can make. I know I'm pleased to see it reissued and I know at least one modeler who is wondering how it would look in pink. Thanks to me for expending the coin of the realm for this one.